The rise and fall of nations and cultures is too abstract for most people. But fiction, especially that informed by journalism, can shows how the sweeping patterns of history play out the micro level. Individual stories can be just as informative as any grand history of the clash of civilizations. H.L. Mencken, who died 57 years ago this week, was the greatest newspaperman of his age, or perhaps of any age. He shaped the thought of a generation with The American Mercury (now available online thanks to Ron Unz). He changed the way Americans viewed the way they speak with his book The American Language. Most critically, as the author of the first English-language book on Friedrich Nietzsche, a champion of free speech and of a kind of idiosyncratic aristocratic radicalism, Mencken has been an important influence on the libertarian American Old Right and the emerging North American New Right. 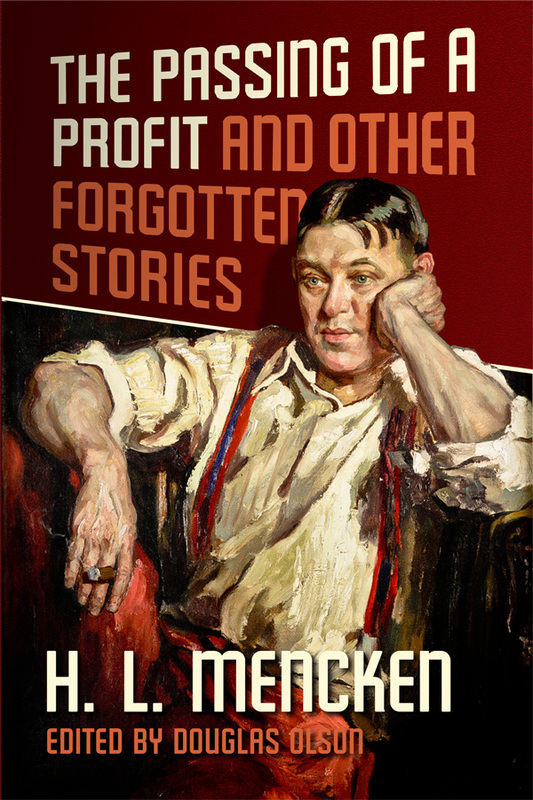 A new collection of Mencken’s early fiction, The Passing of a Profit and Other Forgotten Stories , provides a vital perspective on his vanished world. 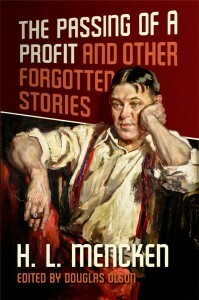 Motifs run through these seventeen tales that were developed further in Mencken’s public writings and private diaries. Among the most important: the confrontation between the civilized Western man and the savage. Like his contemporary H. P. Lovecraft, Mencken identified what he called the “civilized minority” with Northern Europeans. But it’s not a perfect association—Mencken’s contempt for the socially conservative and rural “Real Americans” of the Sarah Palin mold iswell known. And this collection can hardly be called racist. For example, “The Cook’s Victory” is a hilarious recounting of a black cook winning a pardon from a poaching ship captain who wants to execute him for “mutiny.” His victory comes from the captain’s need for his help as the police approach, slowly gaining more and more concessions, finally winning his freedom just as the captain makes good his escape. In “The Crime of McSwane,” a white soldier fighting in a colonial war loses his rifle and goes mad at the reduction in status, encouraging his comrades to die so he can reclaim his position. Other stories show Northern Europeans coming out on top of Southern Europeans or non-white “natives,” but often as a result of swindling or fraud—hardly an edifying picture of the “civilizing” power of Western Man. Still, even in negative stories, there’s a fierce consciousness of status entirely absent from contemporary Europeans. There’s something bracing about tale after tale of laughing and confident British, Germans, and especially Americans casually striding through the Third World like swaggering colossi, changing entire societies on a whim. In “The Heathen Rage,” a German swindler makes his way to Jamaicaand exploits an old royal land grant to a Major Johann von Braun to convince black Jamaicans named “Brown” (which is to say, lots of Jamaicans) that they are entitled to estates. The result is chaos, as the swindler gets more and more legal fees and donations from his prey while feeding them pseudo-legal claptrap about the Magna Carta.Eventually, the minor insurrection is put down, but the German escapes with the cash. Two other Americans who have set up a theater in the Antilles are able to defeat an honor-conscious “Señor” through sheer daring, chasing him down in the dark of night. However, even another “Señor” represents a higher order of civilization than the “fifty colored gentlemen” in “A Double Rebellion.” Mencken notes wryly that “the dark skinned Anglo-Jamaican, be it known, reckons no further in the future than the morrow.” Following a mutiny, the Mexican pilot of the ship is forced into steering the ship, but manages to create such a disruptive voyage that the mutineers leap off the ship in terror, screaming prayers to their pagan gods. Sometimes, the Other thinks that Western men behave the same way, as in “Hurra Lal, Peacemaker.” A doomed native rebellion ends without bloodshed when an Indian living in Jamaica, who has observed Her Majesty’s pith-helmeted legions, appeases them by screaming “God Save the Queen” as if it were a magic formula, not really knowing what it means. The appeal has its intended effect: the grinning white officers show mercy to the defeated. In each case, we are presented with a mirror image of the micro-racial politics of today, with Western men confronting the Other without fear or guilt. However, what is most remarkable for immigration patriots is the attitude of Americans towards their government as they have their lurid adventures abroad. In every story, citizens of the Republic (even scoundrels) are confident that there is a strong government that has their back and will ensure their rights are not violated by foreigners. In “The King and Tommy Crips,” which no parent can read without grinning, a patriotic little boy (are there any now?) is abroad with his father in one of the lesser German kingdoms. Heartbroken at missing the Fourth of July while stuck in a snooty European city where no-one speaks “real English” or follows baseball, the boy resolves to have his own celebration. He throws some firecrackers during a parade for the king. This is interpreted as an assassination attempt by anarchists. Even when the U.S. government is not directly involved, Americans abroad know that they represented a real people. In “Firing & a Watering,” American miners are accosted by a band of would-be Central American revolutionaries who demand their surrender. Instead, the expatriates raise the Stars & Stripes in defiance, inform their “dago friends” that they’ve booby-trapped the river, and eventually use a high-powered hose to defeat los insurrectos in humiliating fashion. Government forces arrive to take credit for the victory and the triumphant Americans laugh good-naturedly. In the “Star Spangled Banner,” a French singer tries to put one over on Americano workers in Latin America by singing insulting Spanish lyrics to the national anthem. Of course, at least some of the Yankees know Spanish and chase him through the jungle for ten miles seeking vengeance. The Passing of a Profit and Other Forgotten Stories is more than a new side of H.L. Mencken: It shows cultural assumptions dramatically different than those of today. What James Burnham called the Suicide of the West now plays out in conversations and business dealings of ordinary people. Today, Western men will strip to their underwear at the behest of nonwhite rioters in London. An American imprisoned abroad, even a United States Marine, knows that his government is essentially indifferent to his fate. Rather than defending its citizens, the American government will sue them on behalf of foreign governments or even arrest them to spare the feelings of the Third World. The Stars & Stripes symbolizes a government actively hostile to the people who built the country. Mencken’s fiction is valuable not just because it’s an enjoyable way to spend an afternoon with one of America’s greatest writers. It’s a way of showing individual people why they should care about the larger issues. Shifting demographics and metapolitics aren’t just about the political direction of the country—it’s about how we have to live our lives every day. Published: January 24, 2013 | This entry was posted in North American New Right and tagged book reviews, H. L. Mencken, James Kirpatrick, literature, North American New Right, reprints, satire, white dispossession, white guilt, white self-assertion. Both comments and trackbacks are currently closed. Yes, but it was good enough to intimidate banana republics to the profit of fruit companies and mining concerns. In my opinion, the best essay on his political views is by my old friend, Murray Rothbard: “H.L. Mencken, the Joyous Libertarian.” It’s available on line. Your worries are not exactly real but worrisome for everybodyelse, to say the least. Sometime ago, one of these, U.S. Marine Staff Sergeant Christopher Van Goethem, killed a Romanian while driving under influence. In plain language as drunk as a pig. Theo Peter was a well known and beloved rock singer in Romania. Now, not that it is a singular case. But the rule of behavior, common to all the members of the embassies. US, Russia, Pakistan, India or Israel – no matter – they seem to hire the worst kind of people in their embassies. Stupid (guess Foreign Office is leading on this), vulgar, dangerous, incompetent, corrupt. They behave like scumbags under their diplomatic immunity and it is a shame that you decry the fact that they are not protected enough. Mencken or not this is jewish mentality and chutzpah. Imitating it is not meant to unify the white race nor to make friends. As an aside, I read some Mencken’s short pieces twenty five years ago in “Sinteza”, a magazine edited by the US embassy in Romania. I liked it very much and somehow resembled to me with the Romanian writer Ion Luca Caragiale. Occasionally I read other pieces with the same delight.